CAMERON PARK, CA--(Marketwire - January 17, 2008) - Firstgold Corp. (OTCBB: FGOC) announces new results from its current Relief Canyon drilling program. "Of the 120 holes currently permitted, 76 reverse circulation drill holes, totaling 20,073 feet, have been completed. Fire assays have been returned from ALS-Chemex for the first 72 of these holes. Both the initial drill results reported on November 19th of last year and these today are representative of a shallow drilling program designed to augment many of the historic drill holes previously completed in the open pit area. The historic holes were greater than 5 years old and a significant percentage of these needed to be twinned to enable our consultant SRK to conduct a technical review. This program is now substantially completed and we would expect a technical report from SRK by the end of February," commented Firstgold CEO Steve Akerfeldt. The second stage of the drilling program involves the testing of deeper targets within the pit and outside the pit to the northwest in the pediment area. To date 7 holes have been completed on this portion of the program totaling 6,213 feet. Results have been received for 3 of these holes, listed in the Table below as RCM07-38, 39 and 72. Three mineralized zones have been intersected on RCM07-72. The highest grade zone consists of 125 feet of 0.08 oz/ton (38.1 meters of 2.49 grams per ton), the thickest section measures 135 feet of 0.04 oz/ton (44.2 meter of 1.26 grams per ton) and the lowermost contains 45 feet of 0.020 oz/ton (13.7m of 0.686 grams per ton). RCM07-72 was drilled to a total depth of 758ft (231.2 m) and encountered mineralization in a sequence of interbedded silty and micaceous limestone and carbonaceous siltstone that occurs immediately below the thick limestone unit that is host to the mineralized breccias exploited in the Relief Canyon Mine area proper. The mineralization is associated with several quartz vein structures with locally extensive wallrock silicification. The trend of the mineralization is unknown. It is uncertain if further exploration will result in a mineral resource being delineated. 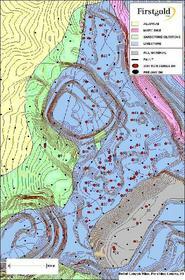 Drilling in this area is currently being conducted. The attached map, figure 1 (www.firstgoldcorp.com/Store/011708PCRCDH35-72.pdf), shows the locations of the current and historic drill holes within the pit area. Previously, we produced a complete overview of our planned exploration activities. (http://firstgoldcorp.com/Presentations/PCRC_Overview_07_11_09.pdf) This review provides significant background on our Relief Canyon properties and our past and current exploration activities. I, Michael R. Cartwright, Registered/Professional Geologist, do hereby consent to the filing of the written disclosure in the Press Release dated 17 January 2008 of Firstgold Corp. I also certify that I have read the written disclosure being filed and I do not have any reason to believe that there are any misrepresentations in the information contained in the Press Release dated 17 January 2008 of Firstgold Corp. Dated this 17 January 2008. About this company Firstgold Corp.